Easy to train, complete system designed around optimal disinfecting and sanitizing chemistries. Maximize Efficiency with the ability to Disinfect or Sanitize up to 4x greater surface area than traditional cleaning programs in no additional time. Reduce infection rates through more proactive and comprehensive disinfection procedures. It is time for a new way - a better way. Evacleans cutting-edge, battery-powered electrostatic sprayers provide a whole new way to attack the problem. A game-changing approach that arms every technician with powerful tools and technology to protect your facility while saving time and money. Electrostatic charged droplets create a field in the spray plume that is magnetically drawn to any surface within 6 feet. With an attraction coefficient 15 times greater than gravity, the electrostatic force field is so powerful the plume reverses direction to coat hidden and hard to reach surfaces that would typically be missed by conventional spraying or misting equipment. Unlike other systems, the Protexus sprayers unique three tiered applicator nozzle is easily adjusted to change droplet size, accommodating any products labeling requirement. This fine-tuning capability provides unmatched flexibility - ensuring consistent performance and versatility, while eliminating the waste and overuse of chemicals. Protexus brings infection control to a new level of effectiveness and efficiency. 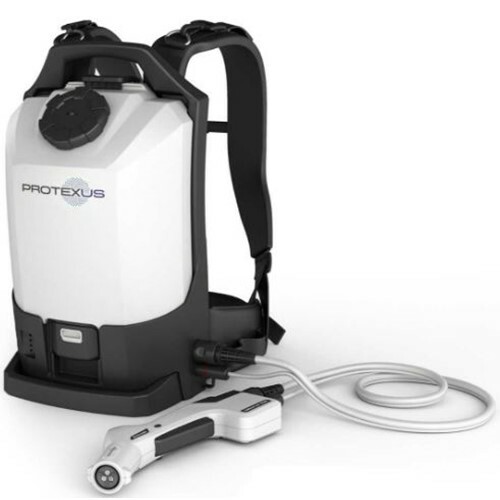 Designed for maximum flexibility, Protexus sprayers are easily adaptable to any protocol - different spray modes, saturation levels or specifications - making it ideal for daily use in any situation or environment.